Shaped from sand and the shells of aquatic life, limestone often includes small fossils and shells, limestone is a sedimentary rock similar in composition to marble. Often considered an ideal surface for serious bakers as the cool stone is perfect for pie crusts, pastries, and other baked goods, limestone has found favor with homeowners due to its luxurious appearance. 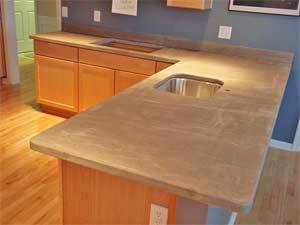 Like marble, limestone is a pliable rock: it tends to discolor and graze easily and is vulnerable to etching. Your limestone countertops can be preserved to help prevent staining and etching, but limestone is not suggested for high use areas such as kitchens. Limestone is available in a range of neutrals and whites, fragile blushes to vivacious blacks.